A tooth extraction can be performed safely and comfortably by your dentist at Broseley Dental Practice. This is a simple and straightforward procedure, which our team has extensive experience in carrying out. You may require a tooth extraction for a variety of reasons and should feel completely reassured that this procedure can be completed quickly and efficiently within our comfortable and hygienic practice. While dentists and hygienists do whatever they can to preserve the health of our patients’ teeth, sometimes extraction is the only option. For example, a tooth may need removal if it has been irreparably damaged due to an accident or trauma, weakened by decay or has died due to an internal root infection. 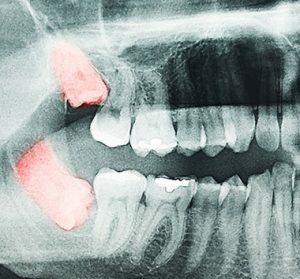 Patients also might require removal of impacted wisdom teeth or the removal of teeth prior to orthodontic treatment. Your dentist will use local anaesthetic to numb the affected area. Once this area is anesthetised, the actual procedure can be completed quite quickly – meaning any discomfort is minimal. Once removed, we will ensure that you are pain free and recommend the best painkillers to manage any discomfort over the next few days. Occasionally, where teeth are severely impacted or you require multiple teeth to be extracted at once, we may refer you to an oral surgeon. However, we will always try and manage your dental needs at the practice first.